Ultimate Fighting Championship (UFC) is bringing a bevy of “Prelims” fights to ESPN+ this weekend (Sat., April 20, 2019) when UFC Fight Night 149: “Overeem vs. Oleinik” storms Yubileyny Sports Palace in Saint Petersburg, Russia. MMAmania.com’s Patrick Stumberg kicks off the UFC Fight Night 149 “Prelims” party with the first installment of a two-part undercard preview series below. The most well-traveled Ultimate Fighting Championship (UFC) veterans duke it out inside Yubileyny Sports Palace in Saint Petersburg, Russia, this Saturday (April 20, 2019) when Aleksei Oleinik faces Alistair Overeem in a match up that features more than 120 combined fights worth of experience. UFC Fight Night 149’s co-main event sees blue-chip prospect Armen Tsarukyan face elite grinder Islam Makhachev, while unbeaten Light Heavyweight Ivan “Ural Hulk” Shtyrkov debuts against Devin Clark. 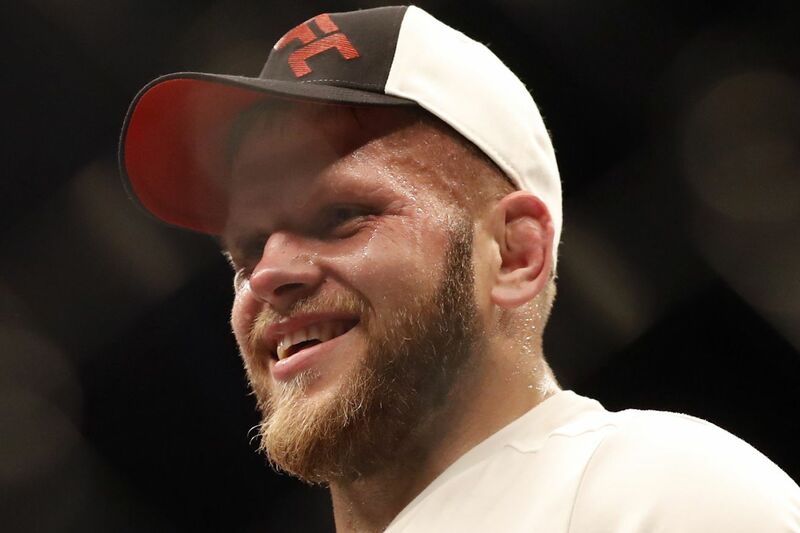 Marcin Tybura (17-4) — the former M-1 Heavyweight champion — won three straight after an unsuccessful Octagon debut, including a head kick knockout of Victor Pesta that secured the Polish veteran a spot in UFC highlight reels for years to come. He came up short in his first main event against Fabricio Werdum and suffered one of Derrick Lewis’ patented shock comebacks, but got back on track in July 2018 with a decision over Stefan Struve. “Tybur” will have two inches of reach on Shamil Abdurakhimov (19-4). Despite an upset loss to Timothy Johnson in his UFC debut, “Abrek” found himself in a main event three fights later, succumbing to a late surge from the aforementioned Lewis. He’s since bounced back with an 84-second knockout of Chase Sherman and a decision over the faded Andrel Arlovski. He has scored eight professional wins by form of knockout, though just one since 2011. This fight is going to be very, very bad. Where most Heavyweights either dazzle with early finishes or empty their gas tanks trying, these guys take a third option and just kinda cruise for 15-25 minutes as needed. They can still finish people, being huge and all, but they’re in no hurry to do so. Abdurakhimov is the greater offender, throwing 37 strikes in four rounds against Derrick Lewis while landing just 15, but he’s also, unfortunately, the sharper striker. He thrives against sedate kickboxers and generally has solid takedown defense while his gas tank holds up, which makes Tybura’s path to victory a murky one. Were this five rounds, Abdurakhimov’s cardio issues would be enough to have me leaning Tybura. As is, I say “Abrek” wins an agonizingly slow striking battle via narrow decision. The berserker approach of Gadzhimurad Antigulov (20-5) earned him two UFC submissions in a combined 3:28 and a “Performance of the Night” bonus on top of that. Injury then kept him out of action for 14 months, after which he lost a wild slugfest with Ion Cutelaba to snap a 14-fight win streak. Seventeen of his 19 stoppage wins have come in the first round. Michal Oleksiejczuk (13-2) survived an early onslaught from Khalil Rountree to win an upset decision, only for a failed United States Anti-Doping Agency (USADA) test to overturn the result. Following his suspension, he returned to the cage in February, laying out Gian Villante with a bonus-winning body shot just 94 seconds into their fight. Poland’s “Lord” is unbeaten in his last 11 fights, scoring eight knockouts along the way. An Antigulov fight will go one of only two ways: either he scores an immediate takedown and locks up a submission within three minutes or he gasses himself out trying. Cutelaba — who boasts an insane gas tank and strong takedown defense — managed to survive the frenzy and smash him with punches. I’m not convinced Oleksiejczuk can do the same. It’s rare to have the potential outcomes be so binary and so utterly dependent on one aspect of a fighter’s game, namely his takedown defense, but here we are. Antigulov’s sprint is not a style that will ever win him a title, but against someone without the tools to handle it, it’s damn effective. He wrangles the Pole to the mat in the opening seconds and goes ham on his neck until he gets the tap. Magomed Mustafaev’s (13-3) upset technical knockout of Abubakar Nurmagomedov made him a hot commodity when he entered UFC, and he lived up to that hype with stoppages of Piotr Hallmann and Joe Proctor. Though he landed some gnarly body kicks on Kevin Lee, his next time out, he ultimately went to sleep from a rear naked choke late in the second round. Multiple injuries make this his first fight in 29 months. The latest monster out of Tiger Muay Thai, Rafael Fiziev (6-0) amassed hundreds of amateur Muay Thai bouts and nearly 50 professional fights alongside his professional mixed martial arts (MMA) record. His time in the cage has seen him score five first-round finishes and mild viral fame for his slick defense. He was originally slated to appear on “Contender Series” last year before running into the same visa issues that plague teammate Mairbek Taisumov. This could easily be “Fight of the Night,” an incredible match up between two ferocious young knockout artists who’ve never seen the third round in 21 combined fights. I will be astounded if this isn’t a knockdown, drag-out slugfest. Mustafaev’s struggles have historically come against takedown specialists, which bodes well on paper, but the stylistic match up looks rough for him. Fiziev thrives when opponents get overaggressive and his crisper punches look like an excellent answer to Mustafaev’s big swings, especially since the latter’s timing may be off after such a huge layoff. Mustafaev would be wise to lean on his submission skills, but his willingness to slug it out looks to be his undoing. Fiziev finds the mark with a dynamite right hand as Mustafaev attempts to brawl his way into the pocket. Three more UFC Fight Night 149 “Prelims” undercard bouts remain to preview and predict, including a 20-1 Brazilian and one of Russia’s best prospects below 155 pounds. Same time as always, Maniacs! Remember that MMAmania.com will deliver LIVE round-by-round, blow-by-blow coverage of the entire UFC Fight Night 149 fight card this weekend, starting with the ESPN+“Prelims” matches online, which are scheduled to begin at 10 a.m. ET, before the main card start time at 1 p.m. ET (also on ESPN+).